2018 is knocking on the front door, and I must say, I’m ready to see what a new year will bring! This will be my 5th year hosting the Community Game-Along here at Chic Pixel, and I’m excited to put the spotlight on even more under-appreciated genres and creators in gaming. Plus, now that I’m doing monthly roundup posts, every month you’ll be able to see what everyone played and get some great recommendations for new games to check out! To join in the Community Game-Along, pick a game that fits the theme of the month and play it. That’s it! You can share your experiences in blog posts, podcasts, let’s play videos, or whatever other medium you like (video game poetry anyone??). Just use the official hashtag to make sure myself and other participants see it! I’ll be monitoring the hashtags every month and retweeting my favorites, as well as including a selection of contributions to the roundup posts. 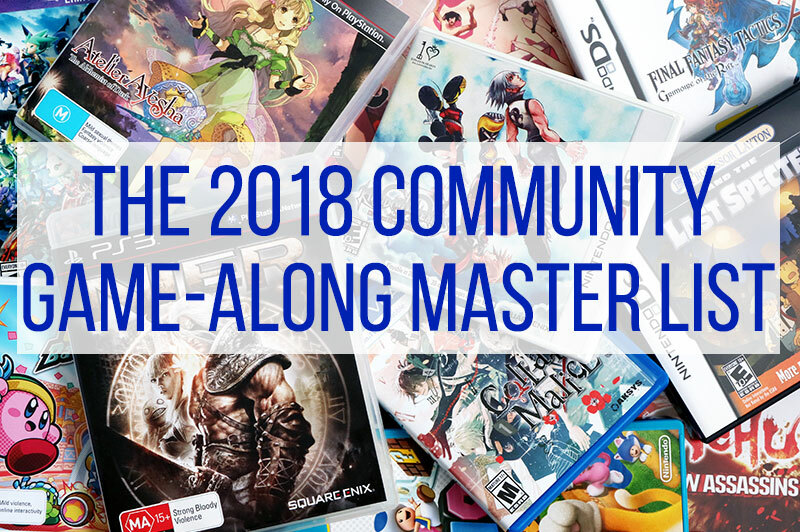 Here’s the full list of Game-Along themes for 2018 so you can start planning out your year! As always, don’t feel obligated to participate every month – just pick the themes that appeal to you, or ones that will help you get through some titles in your backlog. My favorite way to choose a game to play for the month is to survey everything I already own and pick something from my existing library. But, if you want to get into a new genre or series for a specific theme that you don’t own anything for, never fear! At the beginning of every month I always post a handful of game suggestions, including a free option when possible. I look forward to seeing what you play!